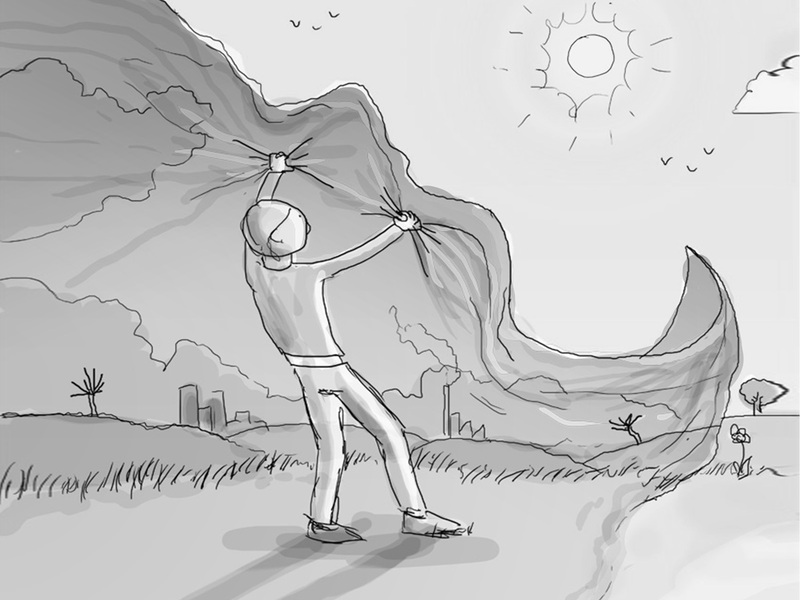 I’ve blogged before about the challenge of creating a campaign for a new season of a returning show and the subsequent difficulties that you face in coming up with something new, fresh, and differentiated from previous campaigns. 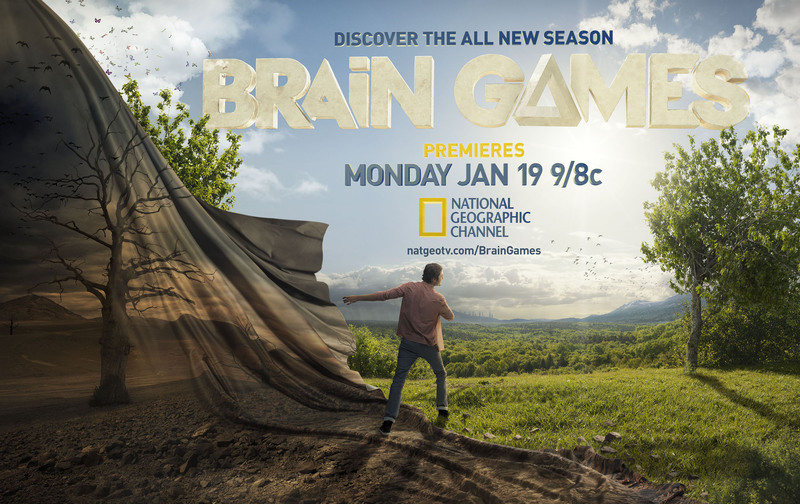 This new campaign for “Brain Games” on Nat Geo is no exception – it was all about how to solve a problem that you’ve already solved before, only this time it demands a whole new answer. This post will be substantially shorter than the “standard” Client Blog post, because frankly the behind-the-scenes video we created to document the campaign says a lot about what we did this season, and how we approached it. Even though the BTS video was already released prior to this post, I did just want to provide a little further peek behind the scenes (I just can’t help myself) into the process and the selection of our creative partners. 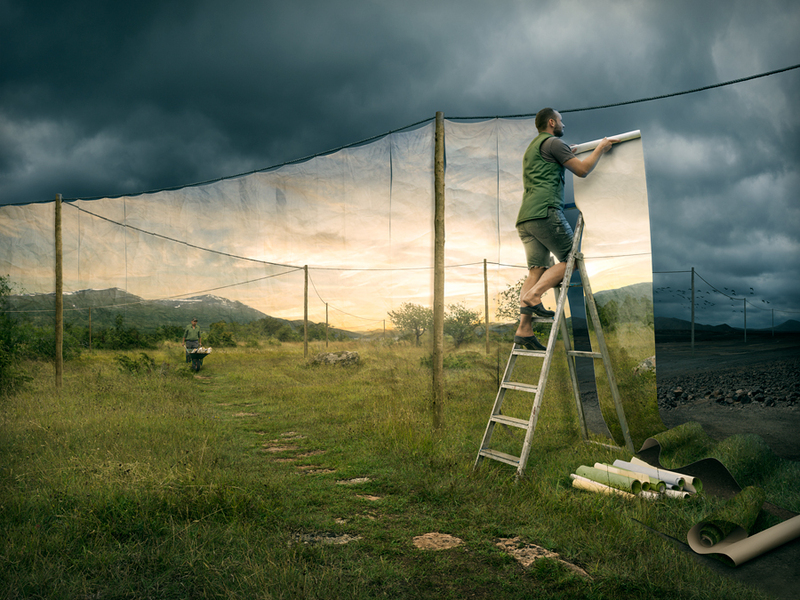 Photographer and Photoshop wizard Erik Johannson and I on set shooting the curtain and background. 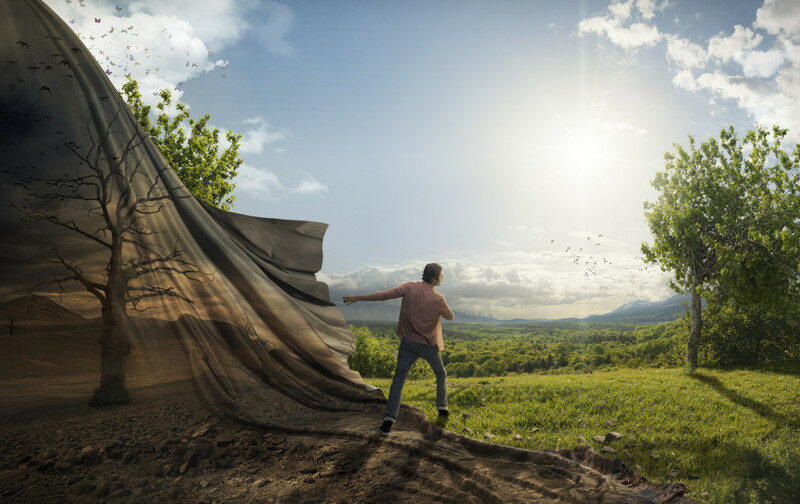 And here’s one of the pieces work he had done previously that we wanted to emulate – showcasing two different worlds crossing over in the same space: Image courtesy of Erik Johannson. Final key art featuring the host Jason Silva. Art by Erik Johannson. Working with someone the caliber of Erik was a wonderful experience. During the course of the project, we experimented with many variations on the sketch, and Erik incorporated our suggestions all along the way (I had been keen on the birds-to-butterflies transition in the top left corner). The final art is fresh, vibrant, and unique. I guess surfing around on BuzzFeed finally paid off! CHAPTER 2: THE TV PROMOS. Working with Bob and Aaron was not only a great honor and privilege, but just a ton of fun. Both were super collaborative and creative and their attention to detail – and there were many details – to each illusion was impressive. We spent an entire day shooting each scene, with about 130 takes of the babies walking on the mat, 65 takes of our arm/leg couple on the beach, and about 60 takes of the yoga woman (which required casting an extremely fit actress). Every single frame and prop for all 3 scenes was highly scrutinized to maximize the illusion along the way. 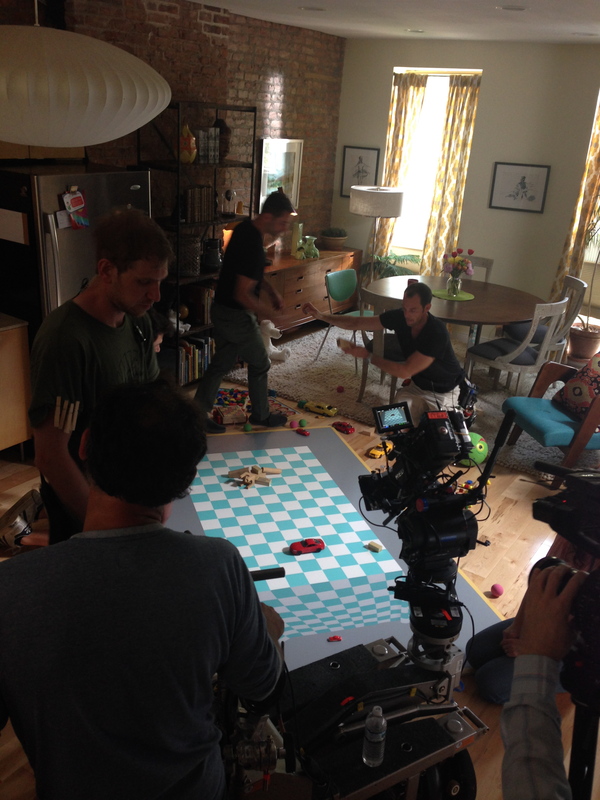 The props had to be at just the right angle, the toys on the ‘table’ picked and switched to maximize the illusion. And both Aaron and Bob were intently focused on making sure that each trick truly ‘worked’ to fool your brain. We played with various toys on the ‘table’ to sell the illusion. Note the big and small red cars at the top and bottom of the table. After hours of shooting the baby scene, we broke for lunch. Aaron and I hung back because I was very concerned that it didn’t look like a baby on a table (I had that classic “worried Client” look written all over my face) – seeing it in person and knowing it wasn’t ‘real’ was probably tainting my perception, but Aaron had a great idea. He used his iPhone and took a video of the playback monitor of one of our takes. Then he took his phone to the streets of Brooklyn during our break and walked up to random people, showed them the video and conducted mini-focus groups! “What do you see here?” he would simply ask them. 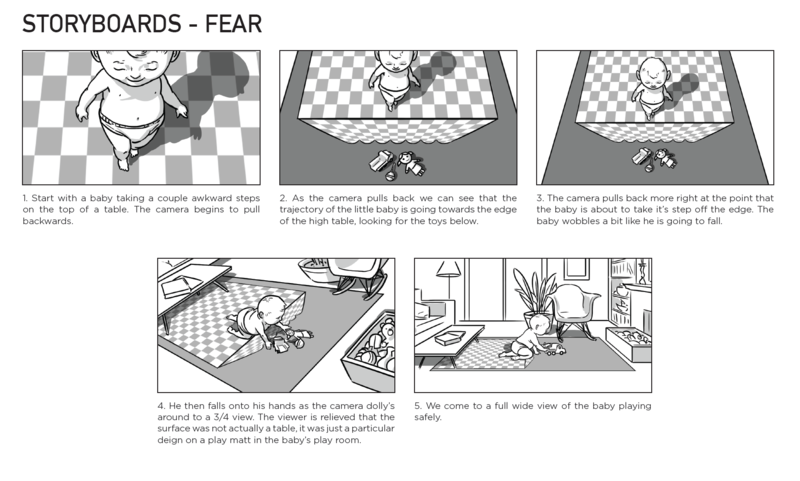 Every single one of the ‘viewers’ knew exactly what was happening, and even though it was on a small iPhone screen with lots of glare on it, a few of them even flinched in fear when the baby takes the fateful step. It takes a pretty confident and open Director to subject himself to that situation, when there’s no parachute should the effect not work. I often wonder what we would have done if people in our impromptu focus group hadn’t been fooled, since we were pretty much all-in to that idea, but luckily – it did work. Shooting the beach scenario with 1st Avenue Machine in Staten Island. The day on the beach for our “romantic” scene also presented a few challenges – finding the right actor who was flexible, had arms that could pass as legs, and a good voice (since he was voicing over the whole spot, which was an interesting reveal in the spot as well). Getting the timing and camera move was something much more challenging than I’d anticipated, as any small variation made the trick not as believable. And you needed to keep both sets of ‘feet’ in frame the whole time, which meant that the actor’s pace had to be consistent each time. 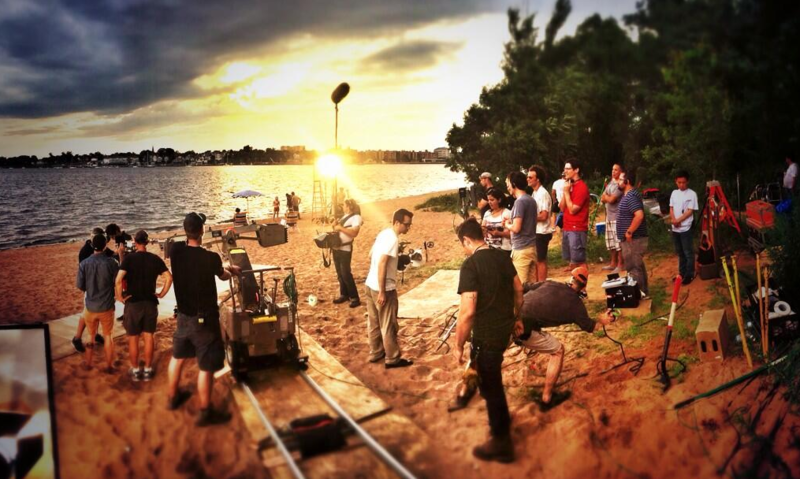 We had a dolly track set up on the beach as well as a faked boardwalk to set the scene. Then the actor would read the script so that his audio would match throughout! Truly a trickier scene to shoot than you’d think, but in the end it’s probably my favorite illusion of the three. Co-director Aaron Duffy (right) rushes back to the monitor after setting up the placement of the hand-feet. As I said in the beginning, the behind-the-scenes piece we put together with our friends at Crave Media in DC really tells the story – so watch the link below for the visual side of story on this campaign. I will say in closing that this project was one of the more fun campaigns I’ve ever worked on, and in large part that was due to collaborating with creative people that I wouldn’t normally get to partner with. Directors who shoot Ok Go videos and photographers like Erik are truly brilliant creative minds with incredibly unique skills and mindsets. Being around them and teaming up with them for this campaign that took many months to produce was a real thrill for me and allowed me to stretch some new creative muscles. I want to give a big thank you to everyone involved on this campaign, and there were many. I hope enjoy this campaign, and this BTS video, as much as we loved putting it all together!